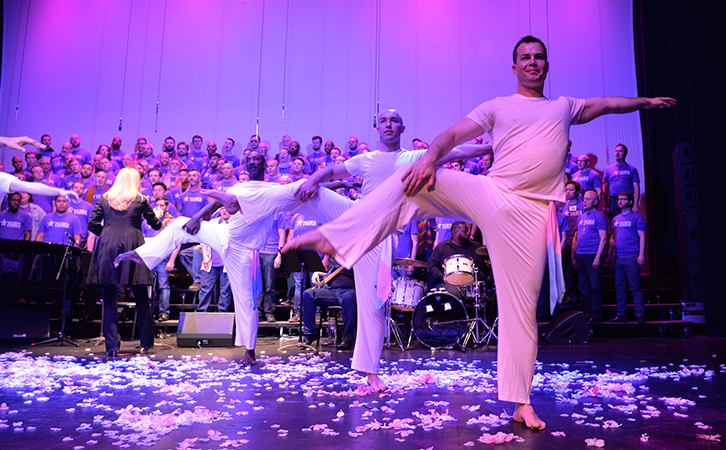 In one of the most timely, important, and liberatory concerts the Gay Men’s Chorus of Washington, DC has yet produced. 'TransAmerica' celebrated the possibility of affirming one’s authentic selfhood without derogating anyone else’s. At a historical moment when appalling new waves of gender fundamentalism sweep our nation, leaving bigotry and violence in their wake, it was beyond refreshing to hear the Gay Men’s Chorus of Washington, DC’s TransAmerica concert Saturday night at Lincoln Theater. Featuring a stage full of soaring, sonorous voices and an astute program of songs in celebration of authentic selfhood, it was, in a word, exhilarating. The significance of the sweeping scope of this concert cannot be overstated. The LGBT world has experienced its own internalized gender fundamentalism, for instance, the uncivil faction who want to “take the T out of LGBT.” Meanwhile, among the saner and kinder-hearted, letters keep being added to the acronym to embrace more and more whose gender identities have been marginalized and disparaged in defense of patriarchal power and privilege. (It’s up to, I think, LGBTQIA+.) 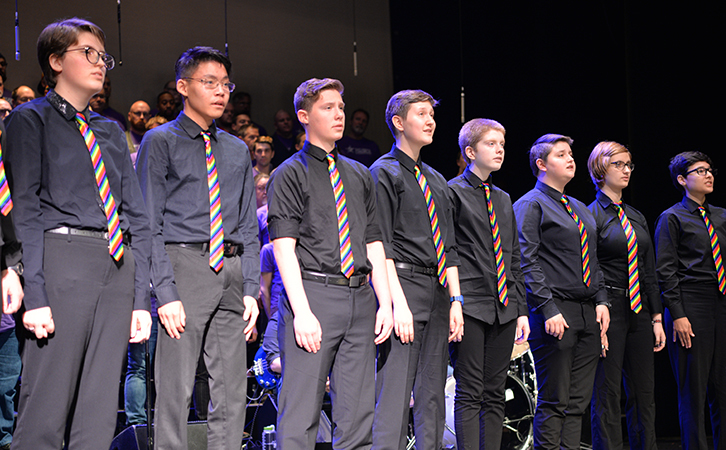 Thus for the Gay Men’s Chorus to declare with this program its allyship with all for whom those four flags fly is a remarkable testament to what “pride” ought to mean. The Gay Men’s Chorus of Washington and the 17th Street Dance performing “I Love You”/”What a Wonderful World,” during the TransAmerica concert. Photo by Michael Key. The GenOUT chorus, performing during the TransAmerica concert. Photo by Michael Key. The moving words of Debi Jackson, the mother of a daughter named Avery who is trans, were read by Vanessa Ford. At four years old Avery told her mom, “You know I’m a girl, right?” Jackson’s family story became a beautiful emblem of acceptance and unconditional love. Don’t let your worst day be your last. Headlining the concert was Breanna Sinclairé, whose awesome operatic soprano filled the house with feeling on “Somewhere” from West Side Story and “You’ll Never Walk Alone” from Carousel. At the end was an uplifting “This Is Me” from The Greatest Showman featuring the entire company fronted by Sinclairé in a duet with JJ Vera. It was a specular finale that for the moment made keeping track of whose gender is what irrelevant. A clear difference even inside. As the person I choose. Help me discover my soul. The concert put centerstage some of the individuals who are most hurt by society’s gender policing. But really, who isn’t? Lots of people go around obsessed with what is normal. People who presume themselves normal go around fearful of those they presume are not. In order to be what they think is normal, they put down those they think are not. Eventually everyone ends up somewhere on that put-down or be-put-down vicious circle. TransAmerica was one of the most timely, important, and liberatory concerts the Gay Men’s Chorus of Washington, DC has yet produced. In each and every programming choice and performance, it celebrated the possibility of affirming one’s authentic selfhood without derogating anyone else’s. That is a radical notion still. The world would be better off if more people got it. This concert set it to music—and left one humming the tune. TransAmerica was presented by the Gay Men’s Chorus of Washington, DC on Saturday, June 2, and Sunday, June 3, 2018, at the Lincoln Theatre – 1215 U Street, in Washington, DC. For future GMCW concerts and events go to their website.